My good friend, Jacob, sent me this signed 1987 Topps Dave LaPoint in exchange (I think) for a few Expos cards that he needed. I have been so slow to ship him stuff, but I'm waiting on the last few names for Expos Fest to be announced. Once they are, Jacob is set to get a decent package of cards. LaPoint (b. 1959) played in the majors from 1980 to 1991 for the Brewers, Cardinals, Giants, Tigers, Padres, White Sox, Pirates, Yankees and Phillies. 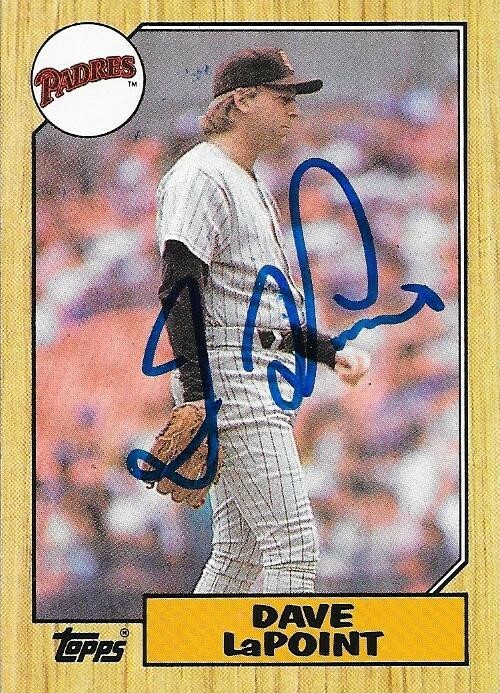 He had a career record of 80-86 with 802 strike outs and a 4.02 ERA. He won the World Series with the Cardinals in 1982. Thanks for the card, Jacob!